No matter how hard she tries, Ellen Burns will never be Scarlett O'Hara. As a little girl in South Carolina, she prefers playing Tarzan to playing Jane. As a teenage beauty queen she spikes her Cokes with spirits of ammonia and baffles her elders with her Freedom Riding sympathies. As a young woman in the 1960s and '70s, she hypnotizes her way to Harvard, finds herself as a lesbian, then very nearly loses herself to booze and shamans. 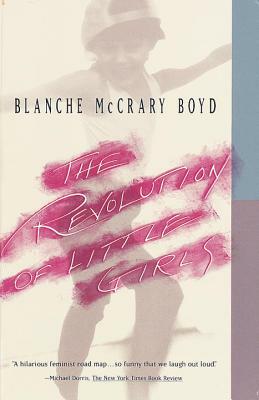 And though the wry, rebellious, and vision-haunted heroine of this exhilarating novel may sometimes seem to be living a magnolia-scented Portrait of the Artist as a Young Woman, Blanche McCrary Boyd's The Revolution Of Little Girls is a completely original arid captivating work. Blanche McCrary Boyd is Professor of English and Writer-in-Residence at Connecticut College, as well as the author of four novels and a collection of essays. Her awards include a Guggenheim Fellowship (1993–1994), a National Endowment for the Arts Fiction Fellowship (1988), a Creative Writing Fellowship from the South Carolina Arts Commission (1982–1983), a Wallace Stegner Fellowship in Creative Writing from Stanford University (1967–1968), the Lambda Literary Award (1991), and the Ferro-Grumley Award (1991). She is influenced by the state she was born in, South Carolina, and her work is often set in the South where her plots focus on gender confusion.